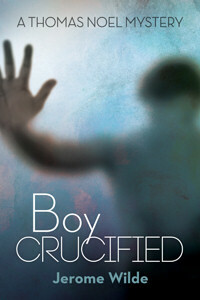 Like much of my work, the action in BOY CRUCIFIED: A Thomas Noel Mystery takes place in an unusual setting. In this case, the background is the Traditional Catholic movement in the United States. I grew up in this movement and I can assure you the truth is stranger than any fiction I might write about it. Traditional Catholics are right wing, conservative types who reject the changes introduced into the Catholic Church at Vatican Council II during the 1960s, such as having the Mass said in English, or entertaining the idea that people of other faiths might actually hope for salvation (Religious Liberty). My group, the Fatima Crusade, was one of the most extreme. We believed all the popes from John XIII onward were heretics, thus not popes at all, which meant that the Chair of Peter was empty and we were living in the End Times. When Reagan choose the elder Bush as his vice-president, we were told Bush was quite possibly the Antichrist. We believed we were the only "valid Catholics" -- all the rest were going straight to hell for embracing heresy. Those were some of the nicer features. Among my group, during the 1970s and 1980s, there was a strong undercurrent of Antisemitism. 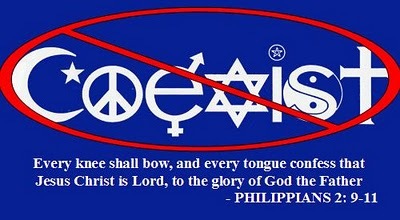 We were lectured endlessly on the Jewish World Conspiracy. We read pamphlets like "The Six Million Swindle," which purported that the Holocaust was a complete fiction. We were told Adolf Hitler was actually a great leader who tried to save the world from Jews. We sang the Nazi anthem, Deustchland Deustchland Uber Alles, at private gatherings, and our leader is said to have had a painting of Hitler hanging over his bed. High school underwent paramilitary training in the style of the Brown Shirts. Read what the Southern Poverty Law Center says. During my time with this group, I experienced various forms of abuse, sexual, physical and otherwise. We had bizarre punishments, shaved heads and whatnot. The group was sued for "alienation of affection" from time to time by estranged family members (usually the spouse of one of our members; wives were encouraged to ditch husbands who refused to follow the party line). BOY CRUCIFIED is about a boy found murdered in a bizarre fashion, the clues leading eventually to a fictitious traditional Catholic group in Missouri that bears many of the common characteristics of traditional Catholic groups, not just the one I belonged to. And while my book is nothing but fiction, Traditional Catholicism is not. The group I belonged to still exists, and despite a lot of scandal, they are going strong. They claim to have cleaned house and gone mainstream under new leadership, ridding themselves of their worst excesses. Perhaps they have; for the sake of their followers, I hope so. The original founder (Bishop Francis Schuckardt, pictured left), who described himself as the "only valid Catholic bishop left on the face of the earth," was ousted in the 1980s and has since died. Read this article on his legacy. 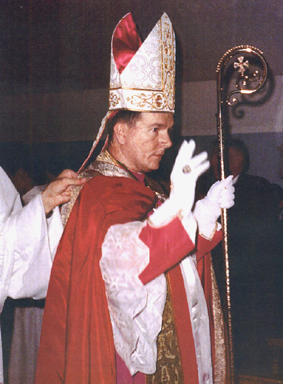 He consecrated two bishops before he died and they continue to run a small splinter group in the Seattle area. They were recently involved in allegations of sexual abuse. Let me point out again (and very clearly) that the Traditional Catholic group ("St. Konrad's") described in my book is complete fiction. If it seems to resemble the Fatima Crusade, that's because it also resembles most Traditional Catholic groups, especially the more radical, right wing groups. There is no "St. Konrad's" in Missouri, or anywhere else. But then again, there are a great many "St. Konrad's," both in the United States and abroad, groups that reject the authority pope and have voluntarily excluded themselves from the Roman Catholic Church, groups who attend Latin Masses and talk about the Jewish World Conspiracy and other nutty conspiracy theories and engage in Holocaust-denying (like Bishop Williamson, perhaps one of the more famous examples). There are even Traditional Catholic popes: Check these out. David Bawden in Kansas, AKA Pope Michael, is one of my favorites. Readers who complain about "all that Catholic stuff" in BOY CRUCIFIED are missing the point: All that "Catholic stuff" is the story, and it's a lot more bizarre than any murder-mystery I could dream up.